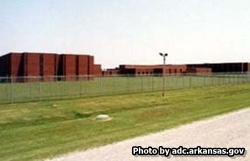 The Maximum Security Unit is located in Jefferson County Arkansas. It houses maximum security inmates. This facility has a capacity to house over 530 offenders. Even though this is a maximum security facility inmates still have access to a variety of programs. Offenders can participate in a substance abuse treatment program, education programs that include GED classes, the PAL program, and a pre-release program that focuses on the reintegration of offenders back into society. Inmates can also work in the fields if they partake in field crops. The maximum security unit also allows inmates to work with animals in the PAWS program. Visiting is on Saturdays and Sundays, usually from 11:30am-3:30pm, but you will need to contact the inmate to get the exact days and times because this is a maximum security facility.